To be honest I never attended a book club, which are quite popular in London. Probably due to the reason I don't read a lot and therefore I'm a slow reader and won't be able to complete reading a book for the meeting. But I do have sweet tooth and occasionally I browse cooking books. The meeting took place in Gelato parlour and while exchanging tips about baking we had ice cream. 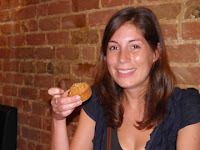 I chose Gelato Mio near Notting Hill Gate tube station as they have ample seating space. Especially on a wet day. Most people brought their own bake to share with the group. Rachel baked for us hazelnut and white chocolate friands. Samantha baked carrot cake, for some reason she decided to name it cheese cake. 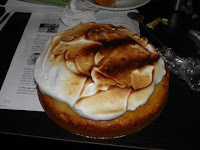 Trina from Trina delicacies baked for the first time Lemon meringue cake. Maria baked for us in her new kitchen pistachio ginger chocolate cookies. Katie baked the rich chocolate brownies. We also discussed tips about baking and Trina comment the tips from the BBC Good Food guide and shared tips from her rich experience in baking. The cook book club was a big success and I plan to organise another similar event in the near future.